much before than ours…Those were the very pious ages when we would hear the Supreme Lord,Sri Venkateshwara,speak to His devotees. A great devotee of Lord Venkateshwara during that period,by the name ‘Thondaman’ was also serving society in the role of the king ‘Chakravarthi’…He is more popularly referred to as Thondaman Chakravarthi.. Being a very fine devotee of great love to the Lord,Thondaman Chakravarthi considered his service to be of utmost importance. The merciful Lord,wanted to reveal the glories of pure untainted devotional love towards Him,with a very enchanting smile on His lips answered to Thondaman as thus. All this conversation was happening while the King was doing His seva to the Lord.the King had been thinking to meet the potter Bheema the following day. 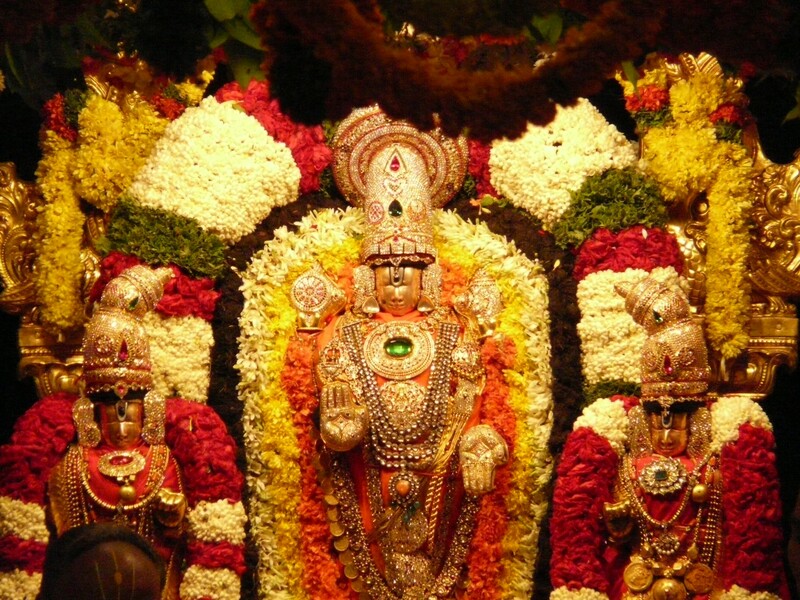 However while perdorming seva to the Lord, he noticed that under the Suvarna Tulasi Dalam that he had offered to Srinivasa out of Devotion,was also a tulasi Dala made of clay. At this,the Beautiful Lord revealed to Thondaman that this was the invaluable offerings made to Him by Bheema,the potter…The king then understood that the Lord has indeed spoken of a great devotee and set to meet him the same sunny day. Fatigued due to travelling such a long distance in the scorching sun,the king,Thondaman,fainted in the vicinity of the residence of the potter…Noticing that,the potter helped the King regain consciousness and took him over to his residence. The King then realized his fault..He had always considered himself as the doer whereas the potter Bheema always considered the Lord as the doer and himself as the just an executor of the Lord’s will. The potter Bheema used to prepare a small Kadai of clay and in it offer to the Lord,whatever meals he prepared for himself…Only the remnants of such offerings would he partake…This unpolluted devotion of Bheema pleased the Lord so greatly that the Lord accompanied by His eternal Consorts,Sri Devi and Bhu Devi,descended in His Divine Aircraft,before Bheema’s thatched hut. Seeing His loving devotee,the Loving Lord,ran towards Bheema and embraced him warmly. He blessed Bheema with His own ornaments and His Consorts blessed Bheema’s wife with Their own ornaments. The Lord ordered His Carrier,Garuda to carry His dear devotee to Vaikuntha in the very same body. From then,everyday the Lord is offered a rice preparation made in curd and served in a clay pot..This is the only offering that is taken inside the main Sanctum Sanctorum,directly into the presence of the Lord. This clay pot is changed everyday with a new one.. Final Note : When I have posted the Telugu version of this cute story,written by Sri.PVRK Prasad,on my Facebook page on 1,April,2015,this guy Vishruta Tarun had posted the above English version in the comments column..
As I was impressed with his writing,I have hidden that comment and decided to post it directly on my site today..Except a couple of small corrections here and there I haven’t changed a word in this story..
BTW dear Visruth,on the same day I have sent you a FB message stating this,but am surprised you haven’t so far seen my message..Since am not your FB friend my message would have gone into your OTHERS box..Please check at least now..